You can save 40 percent of your fuel if you keep your emission and oxygen sensor in tip-top shape. Most recreational vehicles average 7-8 miles a gallon — putting a hefty price tag on long road trips. While you are saving money on food by taking your kitchen with you and on hotels by bringing your bedroom along as well, the price of fueling your home-on-wheels can cut into those savings. 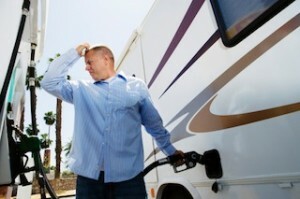 There are simple and easy ways to get the most out of each gallon of gas in an RV. For example, one expert notes that every 5 mph you go over 60 mph costs 10 cents more per gallon. Fill up the tank and write down the current milage on the odometer. When you fill up the second time, write the milage again. Divide the miles you traveled between fill-ups by the amount of gas you bought the second time you filled up. That's how many miles you are getting to the gallon. 2. Check and adjust your tire pressure often. This can make a 3 percent difference. Check tires when cold before traveling more than one mile. 3. Don't leave your RV idling! This is a complete waste of fuel. 4. Use overdrive whenever you can. This saves fuel by decreasing the engine speed. 5. Cruise control also saves fuel by keeping the vehicle at a constant speed. 6. Keep your engine tuned up and in top condition. Follow recommended maintenance schedules. 7. Check your emission and oxygen sensors. Trouble with these can cost you 40 percent of your fuel! 8. Use only the recommended grade of motor oil to increase fuel economy by 1-2 percent. Also, use synthetic oils for another 2 percent savings. 9. Don't speed or put the metal to the pedal. Rapid acceleration reduces fuel economy. 10. 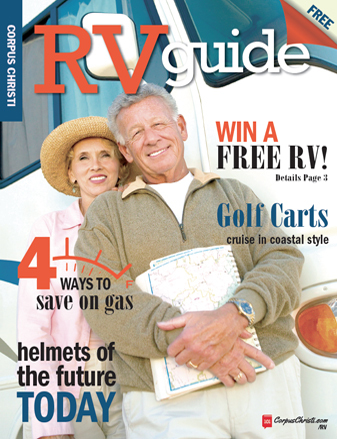 Don't overload your RV! This can have safety repercussions as well. 11. Only use the dash AC when necessary. If you're staying in the Coastal Bend region, check out our Automotive Guide for places that specialize in RV maintenance and repair.